I decided it was high time I got back on the wagon and finished up the handful of cakes I still haven’t yet baked from Rose’s Heavenly Cakes. 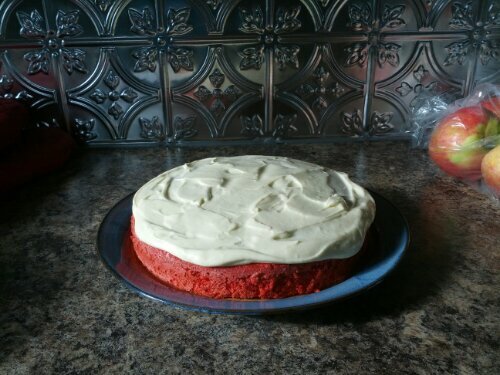 This weekend, I decided to try the Red Velvet cake. Here it is! No process photos because I was in a bit of a rush. I like the icing, which I’ve had on several other cakes, but I can’t say I found the cake itself to be all that exciting. I don’t think I’d make it again, except as a novelty. Trying out something new with this post – posting from my phone. Here goes nothing! Yes, I’m still alive, despite all evidence to the contrary as far as this blog is concerned. I do still bake regularly, I just haven’t baked anything all that new or exciting in the last little while. Mostly, I’ve been baking carrot cakes to use up the funny shaped carrots we dug out of my garden over the last couple of months. That changed this weekend. I’ve never been able to find blanched, shelled pistachios locally, so this weekend, when Jay decided we needed to make a trip to Toronto for some toys for his wood shop, I decided we were also going to make a trip to Tavazo, which claimed on its website (which somehow, I can’t get to right now) to carry exactly what I wanted. By the way, I did make the chocolate soufflé/lava cakes last weekend, but neglected to blog about it. We finished up the kitchen reno on Saturday, then spent the weekend in it, cooking, baking, and prepping. Monday, we hosted my grandparents, 2 sets of aunts and uncles, and a couple of cousins for Thanksgiving dinner. It was a fantastic way to celebrate the end of the reno. And now, off to finish up the packing. Tomorrow night, we’ve booked a car to pick us up and take us to Union Station in Toronto, where we board the train and head west to Jasper, AB, for a 5th anniversary trip, that just happens to coincide with the Jasper Dark Skies festival. I’m so excited! Another weekend, another cake to cross off my list! This week, the Heavenly Cake Bakers group is baking the individual pineapple upside down cakes. I love pineapple upside down cake, so I was looking forward to this one. I made it Saturday, and shared it with a few friends, then shared the leftovers with my parents, when they stopped in for a visit on Sunday. I also made a carrot cake, because my garden’s overflowing with Carrots, but I don’t have pictures of that one. It looked a little like this, only without the raisins. Strike out the German. I just made chocolate cake. I didn’t make The Goop, as Evil Cake Lady called it. I’m not sure if I can count it as knocking one off the list or not. Probably not. Instead of finishing up the cake, I went to see the last instalment of the Harry Potter movies with some friends tonight. All that being said, this is a delicious chocolate cake, and because it’s made with oil instead of butter, it stays moist and soft even when cold, which makes it perfect for ice cream. I love it. Don’t let the title fool you. The cake I made this past weekend, from Rose’s Heavenly Cakes, has nothing to do with salt. In fact, there’s no salt in it. There’s a lot of egg in it, but also a lot of almond, and a lot of air! I’d been ignoring this cake for a while (the rest of the Heavenly Cake Bakers baked it back in November 2009). My reluctance to bake it can be attributed to 2 things: The name, and the lack of frosting. I shouldn’t have passed it up. It’s easy to make (though time consuming) if you let your mixer do the work. I figured it was time I made this cake, in my quest to bake my way through Rose’s Heavenly Cakes. I’m now only one cake away from completing the sponge cake chapter, and since the white gold passion génoise is on the menu for 2 weeks from now, I can finish at least one chapter this month!